In journalism, as in many areas in life, you sometimes find the back-up you need a little too late. 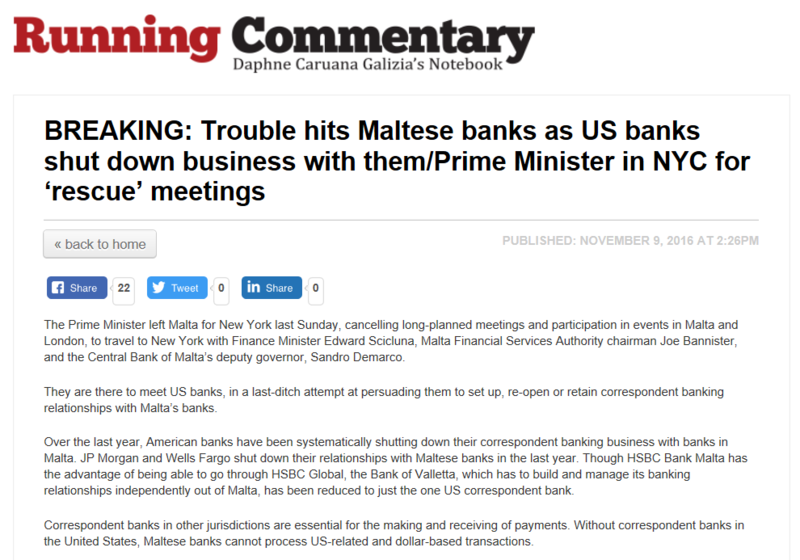 Last November, I discovered the real purpose of the Prime Minister’s sudden trip to New York accompanied by his Finance Minister, the second in command at the Central Bank, and the Malta Financial Services Authority chief: to persuade US banks not to sever their correspondent banking relationship with banks in Malta. They had masked this as a business-generation trip, but I had become suspicious because the deputy governor of the Central Bank and the Finance Minister do not travel with the Prime Minister on business-generation trips, especially not to New York, and especially not accompanied by Joe Bannister. I spoke to some people in financial services and wrote the ‘breaking news’ story here. A couple of the people involved went ballistic, bad-mouthing me as the purveyor of fake news. But that was only because what I reported was 100% correct and they were hoping to keep it hidden. It came down to the usual ‘her word against theirs/I believe her or I believe them’ hogwash that passes for rational analysis in Maltese society. And then yesterday I found this in the payments trade press, which unknown to me had been published just two days before my own piece. It looks like the main purveyor of fake news in this country is the government itself.